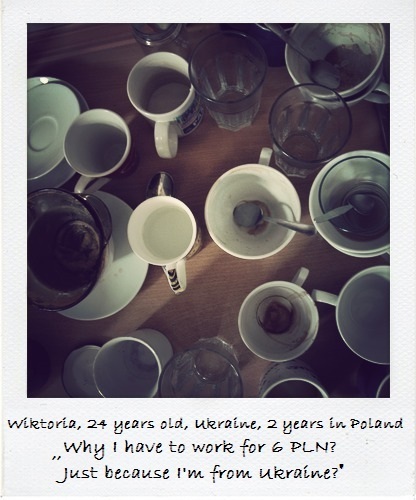 Victoria, a young women from Ukraine, lives in Poland for two years. She came to Poland with visa and work permit and works in a bar. In the short interview conducted by the Institute of Public Affairs she describes how difficult it is for a foreigner to find a job and how long is her waiting for obtaining a residence permit. My name is Victoria, but I would rather not reveal my surname. Please, don’t take a picture of me and don’t take pictures here, in my workplace. My boss would not like it. How long are you here, in Poland? I came to Poland two years ago. How did you legalize you stay? I have a work permit and a visa. I would love to have a resident permit, pay social security tax, pay bills, live here legally, normally. But for now – I still have to wait for the decision. How long have you been waiting for the decision? I have been waiting for four months. It is really horrible. I would like to live normally and legally: pay bills, travel, but I still don’t know where I stand. It is a really strange situation that the person who lives here illegally has fewer problems than the one who lives legally… Isn’t that weird? Once you decide to legalize your stay, you face administrative and bureaucratic barriers so that it may turn out that it’s easier to live here illegally. I like it very much, but I would like to visit my parents in Ukraine more often. I haven’t seen them for two years. When I want to go back to Ukraine, I need a special document, but the Office for Foreigners refuses to issue it. That is why I can’t visit my parents – I am too afraid that they won’t let me come back here. It’s a huge problem for me. I miss them very much, even though I have some friends here, in Warsaw. Have you had any problem with looking for a job in Poland? Job? It is very hard to find a job and accommodation here if you are a foreigner. At first I wanted to wash dishes, but they told me: “you don’t look good enough”. Nice, healthy, normal girl wants to wash dishes and she can’t, because she is not a top model? It’s also strange for me that employers offer lower wages for foreigners. Why I should work for 6 PLN? Now I work in a bar, so it’s not that bad, but my future is still in someone else’s hands, I still wait for the decision regarding the legalization of my stay here.